"Conversational Music" is a subtle delight, the work of 2 friends who truly enjoy playing together. The fact that they had not performed together in 15 years only adds to the palpable joy emanating from the music. For more information, go to www.aaronalexander.com. Ms. Fujii, like Duke Ellington, writes for her musicians, writes to their strengths and uses as broad a pallet as both Duke and Billy Strayhorn. The opening track, "The North Wind and The Sun" has big sweeps in sound, from throbbing drums to whispering trumpet. There are 6 soloists and each gets his own background - Herb Robertson (trumpet) plays over a dirge while Andy Laster (baritone saxophone) gets a section that has a quick give-and-take and a short, boppish, rhythm. Ellery Eskelin (tenor saxophone) takes a hearty solo over Stomu Takeishi's strumming electric bass lines. Ms. Fujii's husband, trumpeter Natsuki Tamura, takes the piece out with what sounds like a squealing teapot. 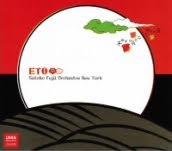 "The Eto Suite" is based on the Chinese zodiac; there is an "Overture"and "Epilogue" and, in between, 12 short pieces, each one named after the animal in the zodiac and assigned to a soloist. Examples include Joey Sellers (trombone) as "Ox", with a lovely melody and fine harmonies from the reeds and brass. Tamura's hissing/sputtering trumpet is "Snake" (with a Black Sabbath-like "heavy" rhythm section and forceful reeds. The alto saxophone of Briggan Krauss is "Boar" and this one shakes his head, roars, and shouts over the rampaging drums of Alexander and shouting brass. The final 2 tracks on the program, "Pressure Cooker" and "Stroll", both contain great section writing, with the former playing the reeds off the brass while Alexander and Takeishi really push the proceedings, especially under trombonist Joe Fielder's solo. Frank London (trumpet) goes from furious to muted in the span of 30 seconds. The latter track opens with Chris Speed (clarinet) and Herb Robertson musically chattering at each other before the rest of the group comes in on throbbing drums. There is a handsome melody played by the reeds and brass which sounds influenced by Japanese folk music before trombonist Curtis Hasselbring takes a rambling yet forceful solo. Ms. Fujii's piano remains in the background throughout the CD but her creativity is front and center. Her ability to create such intense music that never blares, where each voice gets its due and where the sections have such fascinating melodic and harmonic variations to play is so impressive. Like the large ensemble writing of her contemporaries John Hollenbeck, Maria Schneider and Jim McNeely, Satoko Fujii makes music that is her own. Listen to Jason Crane talk with Ms. Fujii and Natsuki Tamara on "The Jazz Session" by clicking here - you should also go to www.satokofujii.com to discover the many facets of her talent. 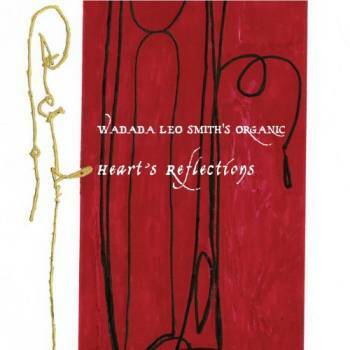 Wadada Leo Smith continues to make music that defies categories. "Heart's Reflections" (Cuneiform Records) features a 14-member ensemble that includes 4 guitarists, 2 bassists, 2 saxophonists, piano, violin, the mighty as well as subtle percussion of Pheroan ak Laff and 2 people on laptops. How best to describe the music? There are long stretches of music that have the feel of Miles Davis circa "Big Fun", the sound replete with chunky rhythm guitars, funky bass lines, pounding drums, Smith's electronically distorted trumpet filling the sound spectrum and more. But there are also pieces that move in unexpected directions, such as the 11-part title track subtitled "Splendors of Light and Purification (for Shaykh Abu-al-Hasan al-Shadhih.") Ranging from rhythmic romps, such as "The Majestic Way" to musical meditations such "Spiritual Wayfarers", the different voices sometimes speak as distinct soloists, other times in group settings. Most impressive are the multiple contributions of Angelica Sanchez (acoustic piano, Wurlitzer electric piano) and the creative interplay of bassists John Lindberg and Skulli Sverrisson. It is also good to hear the guitar work of producer Michael Jackson who turned many an ear when he arrived on the scene in the 1970s. The program is book-ended with 2 long pieces, both dedicated to contemporaries of Smith who have passed on. "Don Cherry's Electric Sonic Garden (for Don Cherry)" rides atop the hard-edged funky drumwork of ak Laff while "Leroy Jenkins's Air Steps (for Leroy Jenkins)" is a multi-sectioned work with stunning guitar work from Brandon Ross, the fiery violin playing of Stephanie Cheng Smith, and the leader truly digging into the ferocious groove laid down by ak Laff. Later in the piece, the trumpeter takes a long solo that is heartfelt and quite prayer-like. Like Louis Armstrong, Miles Davis and Dave Douglas, Wadada Leo Smith sounds like himself in all musical situations. One can get lost is his clarion-call trumpet as well as his forays into electronics while his episodic compositions and intelligent arrangements offer much to the listener who desires a challenge - yet there are also moments that soothe and careess the ears. To find out more, go to www.wadadaleosmith.com. Before that, he'll appear this Monday night (July 25) in Hartford, Jazz in Bushnell Park series. With his long-time musical compatriot James Weidman (piano), they'll be "Paying Tribute to the Great Abbey Lincoln", the wonderful vocalist and songwriter who passed 11 months ago. Joining them will Bruce Cox (drums), Brad Jones (bass) and Leena Conquest (vocals.) Ms. Lincoln amassed quite a songbook over her 4+ decades as a singer so this concert looks to be an exciting evening. Opening the show at 6 p.m. will be the UMOJA Ensemble with the headliners onstage at 7:30 p.m. If you are unable to attend, tune in to WWUH 91.3 FM or online at wwuh.org. In case of bad weather, the show moves indoors to Asylum Hill Congregational Church, 814 Asylum Avenue. For more information, go to www.hartfordjazzsociety.com. One of Professor Hoggard's students was profiled in today's Sunday New York Times (here is the link - www.nytimes.com/2011/07/24/arts/music/the-vibraphonists-jason-adasiewicz-and-chris-dingman.html.) Chris Dingman came to Wesleyan in 1998 as a drummer and soon switched to vibraphone at his Professor's suggestion. After graduation, he attended the Thelonious Monk Institute (at that time, based in Los Angeles, California) and began a career as a professional musician. Wes grad Steve Lehman (saxophone) hired him and Dingman has appeared on several of his CDs as well as being a member of his touring group. Earlier this year, Dingman self-released his debut CD, "Waking Dreams", and it is one of the best recordings of this (or any recent) year (my review is here.) Professor Hoggard and the Wesleyan Music Department gets a good deal of credit in helping young Mr. Dingman on his way. Check it out! I admit to rarely moving out of my comfort zone, basically the room with the computers and the CDs. Bur, I do love "live" music, I like to watch musicians interact, create on the spot, "think" on their feet, and react to the audience. Last night, I hopped into the car and drove 80+ miles to Montague, Mass, the home of the Montague Bookmill, an old grist mill that's been converted into a bookstore/performance space with quite the cafe on the lower level. 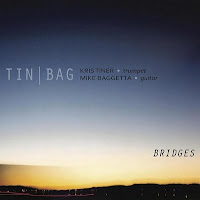 I went to see and hear TIN/BAG,the duo of Kris Tiner (trumpet) and Mike Baggetta (guitar), whose new CD "Bridges" (Mabnotes) is one of the better releases of 2011 (my review is here.) Opening the show was a high school friend of Baggetta's, singer-songwriter-acoustic guitarist Nathan Hobbs. In the humid air, with windows wide open, fans whirring and the sounds of the Cafe's customers ringing through the room, some of the subtleties of Hobb's lyrics got lost. But his guitar was mesmerizing, the slow quiet delivery of the words often hypnotizing, and, in the summer's heavy air, the music was soothing to the ears. After a short break, Messrs. Tiner (a resident of Bakersfield, CA) and Baggetta (now living in New York City) moved into the title tune of the CD. The guitarist opened the piece solo, overtones, full chords, a handsome melody rising out of the introduction - Tiner, who gets his "wild on" with the Industrial Jazz Group, moved easily into his melody lines, never forcing the pace. His crisp tone meshed well with the fullness of the amplified guitar throughout the evening. Their music, too, was mesmerizing but a bit more playful with a Hank Williams tune (there was than a touch of Bill Frisell in Baggetta's sonic explorations) and a straight-forward reading of "Broken Windmills", a pensive ballad from the Blue Cranes. Closing with a Willie Nelson song (sounding a lot like "The Tennessee Waltz"), the music soared through the room, landing softly on appreciative ears. Despite the humidity, the intimacy of the music and the creativity of the duo made any physical hardship seem minor. Although the duo does not play together as often as they (or music lovers) would like, they have a West Coast tour planned for October of this year. To find out more, go to either kristiner.com or www.mikebaggetta.com. I drove home from the concert listening to trumpeter Randy Brecker's sumptuous new recording with the DR (Danish Radio) Big Band, Michael Bojesen, conductor. "The Jazz Ballad Song Book" (Red Dot Music/Half Note Records) has much to recommend it, not the least of which is Brecker's impressive melodicism, his fine solos and rich tone. Surrounded by the 19-piece aggregation plus the Danish National Chamber Orchestra, the program ranges from classic standards, such as "Cry Me A River" (with an evocative arrangement from Jasper Riis) and "Skylark" (arrangement by Gerard Presencer and Siobhan Lamb) to jazz favorites such as ""Round Midnight" (arrangement by Bill Dobbins with the string arrangement by Siobhan Lamb). There's a particularly rousing take on John Barry's "Goldfinger" (with excellent drum work from Soren Frost). There are even a pair of Brecker originals, "Foregone Conclusion" (a funky piece arranged by Vince Mendoza) and the light-hearted "I Talk to the Trees" (also arranged by Mendoza), impressive for the way the arrangement wraps the brass, horns and strings around Brecker's trumpet lines. There are a few moments when the strings, to my ears, get in the way but, most of the time, the arrangements are imaginative, well-played and add greatly to the presentation. Randy Brecker never falters, displaying his creativity solo after solo, while members of DR also get the spotlight on a number of tracks. This may remind some listeners of Miles Davis & Gil Evans' work on "Miles Ahead" (no strings attached to that but listen to the rhythm sections) - "The Jazz Ballad Song Book" hearkens back to that collaboration and is mighty easy on the ears. For more information, go to reddotmusic.net. Louis Armstrong took much heat during his life but, most often, let his trumpet and songs do the talking. Ricky Riccardi's book gives the man his proper due and it would be great to hear all the songs he references in the text. You can actually do that by going to Riccardi's excellent website - dippermouth.blogspot.com - and, what a treat that site is. Along with Terry Teachout's 2009 "Pops", "What a Wonderful World" makes abundantly clear just how much "Satchmo" meant to American music in the 20th Century. 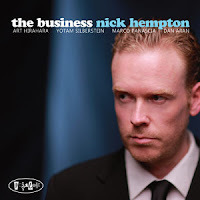 Saxophonist Nick Hempton has got something good going-on in his sophomore release, "The Business" (Posi-Tone Records). If you just put the CD on and go about your business, this sounds like fairly solid, straight-ahead, "post-bop." When you listen closely, you hear a real band at work. Whether it's singing, swinging, lines of bassist Marco Panascia or the inventive drumming of Dan Aran, this music is, for the most part, filled with joyous moments. Then, there are the voicings and flights of fancy from pianist Art Hirahara and all one needs is some good tunes to "blow" on. Mr. Hempton, a native of Australia, has been leading the band for the better part of 5 years and one can easily hear that they are comfortable with each other. Guitarist Yotam Silberstein joins the group on a number of tracks and he, too, fits right in. Whether it's the martial strut of the drums on "Press One for Bupkis" (with a melody line that echoes that of "To Life" (from "Fiddler on the Roof") or the low-down blues of Don Redman's "Gee Baby, Ain't I Good to You" (where Hempton's tenor has the weight of the best work of Ben Webster), this is so much more than "background" music. The other "cover" tune is an inspired choice. The quartet dances its way through Rahsaan Roland Kirk's "From Bechet, Byas, and Fats"- in the second half of the song, the band doubles the pace for a romp of a solo from Hirahara followed by a ever-shifting exchange of the drummer with the rest of the group. Hempton displays a lighter tone on the handsome ballad "Encounter at E"; listen to the piano accompaniment, spare yet effective or Aran's "conversational" drums and the way Panascia propels the piece (nice, melodic, solo as well.) Everyone gets "funky" for "Not Here For a Haircut", Hirahara's Fender Rhodes dancing atop the "fatback" drums, the chunky rhythm guitar and the bouncing bass. Hempton, in contrast, takes a measured solo, filled with melodic flourishes, giving way to Silberstein's bluesy turn. There's a bit extra bounce in everyone's step on the closing tune, a "hot" number called "Carry On Up The Blues." This is definitely one of the "happier" blues tunes you'll ever hear. The CD is in Nick Hempton's name and, while he wrote the majority of the tunes, the success of this music is in the spirited work of all involved. If somebody going to give you "The Business", don't say no! Guitarist-composer Brent Canter, born and raised in Los Angeles, California, wisely titled his debut recording for Posi-Tone Records "Urgency of Now." One can hear he has a story to tell and is so ready to tell it. Joined by his working Trio of Adam Klipple (organ) and Jordan Perlson (drums) as well as special guests Pat Bianchi (organ on 3 tracks) and Seamus Blake (tenor saxophone), his music has well-formed melodies, is spacious when it needs to be and "rocks out" on several occasions. "Meet Me Halfway" features a guitar tone that may remind some of Carlos Santana as well as a strong melodic line built by both the guitarist and Bianchi. Perlson pushes and pulsates while the soloists ride his flow. Another fine melodic piece is "Settle Down", a gentle ballad that is soulful and emotionally rich. There are several tunes that really jump out of the speakers. "With Eyes Closed" builds up from the drummer's exciting opening salvo but, instead of going "all-out", Blake and Canter read the melody as Klipple (who leads the quartet Drive-by Leslie) burbles beneath them. His solo starts in the lower registers of the organ and grows in intensity with the help of Perlson's slashing drum work. Canter also starts in a subdued fashion but is soon pushing against the insistent drum work and big organ chords. Blake just "gets down" and rides the percussive waves to an exciting finish. "A Long Way From Home" is another tune that blends a soulful approach, forceful, funky, drumming, and spirited solos from all. "Urgency of Now" has excellent sound; one can really pick out the individual instruments, even when the musicians are moving through intense sections. It should come as no surprise once you hear the fine music on this CD that Brent Canter won the 2011 ASCAP Young Composers Award. There are moments that his tone and attack remind this listener of John Abercrombie (especially in the way the elder guitarist builds his solos.) This impressive CD is yet another fine example how contemporary music continues to grow well into its 2nd century. For more information, go to www.brentcanter.com. Lately, I have been receiving weekly emails from the Cornelia Street Cafe, located at 29 Cornelia Street in New York City. Their food is quite fine but their menu of "live music" is totally delectable. Many of the finest creative musicians get to play there - in the coming week alone, vocalist Lainie Cooke plays there tonight (7/12/11) with a ensemble featuring drummer Matt Wilson while on Friday (7/15), pianist-composer Matt Mitchell brings in a group featuring guitarist Mary Halvorson, saxophonists Tim Berne and Oscar Noriega, bassist John Hebert and drummer Tomas Fujiwara. The following night, bassist Mario Pavone presents his "Arc Suite" ensemble featuring Matt Wilson, pianist Craig Taborn, saxophonist Tony Malaby and others. Get the idea - this is serious venue for fans of this music. 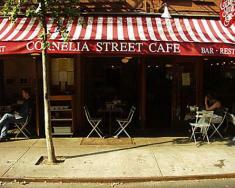 So, if you plan a jaunt to the Big Apple, I strongly suggest heading to the Cornelia Street Cafe. To find out more, go to corneliastreetcafe.com and get excited. If it's a sunny day, raise the blinds, open the window and turn up the speakers. On a cloudy day or late at night, keep the volume level lower but sit back and join pianist Larry Goldings. He's invited listeners to join him "In My Room" (BFM Jazz) and, yes, it's a personal journey but should ring true for many people. If you've listened to music all your life, chances are good that the tunes blasting out of your AM radio when you were 13 (or FM radio at 18) still reverberate with you. It's why "oldies revues" are so popular, they remind so many of us of simpler times. Larry Goldings mixes old standards with "pop" tunes from the 60s and 70s plus a few originals on this recording. It may be a jaunt down "Memory Lane" but this no attempt to cash in on a trend - it's just good music lovingly played and recorded. The title track is the Brian Wilson ballad and Golding's really captures the innocence and longing in the song. Elsewhere, he does a sweet job on both "Take Me Out to the Ballgame" and "Beautiful Dreamer". There's also a fairly straight-forward take on The Zombies' "A Rose For Emily" while Golding does a sweet job of finding the emotional heart of Joni Mitchell's "All I Want." The pianist, who has never had an issue about mixing musical styles, digs into Abdullah Ibrahim's "The Wedding" - his left hand takes on a more formal role than in the South African piano master's version, adding wonderful colors to the folkish melody. Of the originals, "Crawdaddy" is a lilting tribute to New Orleans, with touches of both Allen Toussaint and Scott Joplin while "Roach" is dedicated to drummer Max Roach and Abbey Lincoln. The latter track references the duo's version of "Driva Man" from "We Insist: The Freedom Now Suite", doing so with drama, force and emotional strength. One can (and, I believe it's Larry Golding's design) look at this recording as a journey of the pianist's musical discoveries. Starting in his room and going "Here, There, and Everywhere" (the Lennon-McCartney song that ends the CD) in the course of 16 tracks, there's so much variety here yet the program never wavers from its mission of melodic explorations. A "Romantic" conceit perhaps but done so honestly that the results are quite satisfying. For more information, go to www.larrygoldings.com. Having seen (and chatted with) the Heath Brothers Band live in Chicago last year made me happy they would grace The Village Vanguard this week with their presence. Saxophonist Jimmy and younger brother and drummer "Tootie" (Albert to some) have been "on the road" for almost 4 decades while continuing their separate careers as leaders and sideman (bassist brother Percy passed in 2005 but the band plays on. WBGO-FM was in attendance on the first night of the quartet's stay (bassist David Wong and pianist Jeb Patton round out the HBB) and you can hear the opening set of Wednesday July 6 by go to www.npr.org/2011/07/07/137630342/the-heath-brothers-live-at-the-village-vanguard. True, it's more fun to seen and hear them live but the folks at WBGO-FM do a fine job of making one feel part of the crowd in attendance. Dig that crazy boater on the always fashionable "Tootie" - he really should take part in a fashion show with fellow drummer and snappy dresser Roy Haynes! This is the 3rd CD as a leader for composer-pianist John Escreet, his 2nd for David Binney's Mythology label and his 1st to fully embrace technology. "The Age We Live In" features Binney on fast and furious alto saxophone and electronics, the highly explosive guitar work of Wayne Krantz and the muscular "in-your-face" drumming of Marcus Gilmore. The new recording is, melodically and harmonically, similar to Escreet's previous Mythology CD, "Don't Fight The Inevitable", but is louder, funkier and has frequent touches of fusion. Escreet's synth work on the title track may remind listeners of Joe Zawinul. For the most part, the songs are shorter than the ones on the earlier release while the trumpet of Ambrose Akinmusire has been replaced by the fiery and marvelously "bent" guitar work of Krantz. Bassist Tim Lefebvre only appears on 2 of the 12 tracks so Gilmore is the "rhythm section" and "bottom" of this music - he is more than up to the task. He owns the short but blazing "Kickback" and his thunderous solo on "Stand Clear" rattles the speakers. Gilmore, certainly lights a fire under Binney on several tracks who plays with absolute abandon, with long flurries of notes scampering from his saxophone. He creates a burning solo on "Half Baked" (not an an apt description for this "flaming" track). There are also several moments where Binney caresses the melody line; for example, he builds a lovely statement on "Another Life" that is emotionally satisfying and musically rich. One notices several things about John Escreet -you can never be quite sure where this music is going and he rarely repeats himself on solos. He is thoughtful and exciting, a musician who, if he chose, could play rings around other players. Instead he creates pieces that have fascinating melodies, arrangements that show off the soloists and ideas that resonate with the listener long after the last song ends. His willingness to move away from any semblance of a "comfort zone" is yet another cogent reason to pay attention this challenging and entertaining recording. Several of the tracks blend acoustic piano and electronics in exciting and impressive fashion. The interaction of piano and synthesizer on "As the Moon Disappears" is smartly done and, when Escreet begins to whistle the melody, it's a lovely turn. His arrangements also deserve praise for the way he knits the string work of Christian Howes into the mix as well as the appearance of trombonist Max Siegel and trumpeter Brad Mason on "A Day in Music." John Escreet, at 26, is already an impressive musician and a composer who eschews boundaries. Thanks to David Binney for giving Escreet the platform for his lively and exciting music. For more information, go to www.johnescreet.com. 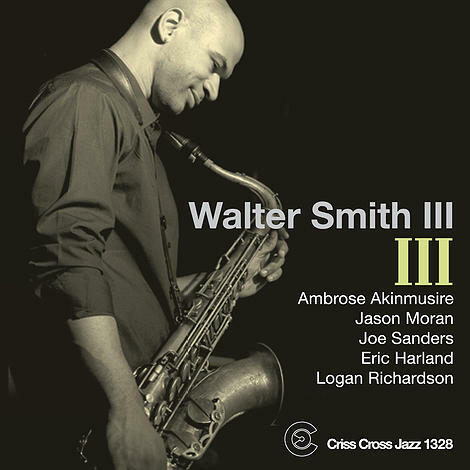 I'm just catching up to tenor saxophonist-composer Walter Smith III and his latest recording. Sort of self-titled, his third CD comes via Criss Cross Jazz and producer Gerry Teekens. Released in September of 2010, I purchased the CD from Ed at Integrity 'n' Music in Wethersfield, CT - it's very possible that this fine store may be the biggest outlet for Criss Cross in the state. Smith, a native of Houston, Texas, has toured and/or recorded with Terence Blanchard, Mose Allison, Christian Scott and many more. He has a lighter tone but a strong attack while he writes pieces with strong melody lines and rhythmic patterns that are not always "standard jazz-style." He's assembled quite a group including the seemingly ubiquitous Ambrose Akinmusire (trumpet), Joe Sanders (bass), the splendid drummer Eric Harland and pianist Jason Moran (alto saxophonist Logan Richardson appears on 1 track.) The program commences with "Working Title" and, after a handsome unaccompanied tenor statement, the quintet moves into the body of the tune, ushered in by the exciting "give-and-take" in the rhythm section. Harland skitters around beneath the hard-edged trumpet solo while the bassist adds counterpoint and Moran contributes abstract colors. The drummer's conversational style varies between excited and subdues under Smith's tenor solo and flat-out drives when Moran takes his dizzying romp. The trumpeter sits out "Capital Wasteland", a medium-tempo, thoughtful, work with a finely-constructed melody. The pianist draws a ruminative picture on his solo, as if surveying the landscape while Smith rises above the city like an eagle. His style may remind some of Mark Turner in that both musicians are thoughtful soloists who build their statements logically from the harmonies and rarely, if ever, overplay. Other highlights include the lovely tenor-piano duet "Aubade". co-written by Moran and the late Andrew Hill - the melody lines emerges out of the quiet piano chords and holds one spellbound. The spell is immediately broken on the following track, "Byus", with Harland's explosive opening statement. The piece blends many different elements (you can hear funk, straight-ahead jazz, and more) as the band moves forward. Fellow Houstonians Moran and Harland create a propulsive dialogue alongside Sander's ever-mutating bass counterpoint. Akinmusire's "Henya", a sparkling melody, is given the gentle treatment it deserves - this is the 3rd version of this song to be released in the past year (on Akinmusire's Blue Note release and a haunting rendition on the new Gretchen Parlato CD). The melody and harmonies offer so many possibilities that one could play them back-to-back and hear something new each time. "III" is delightful creative music and, if you have not heard it yet, wait no longer. Turn up the volume and let these delicious sounds wash over you. For more information, go to www.waltersmith3.com. 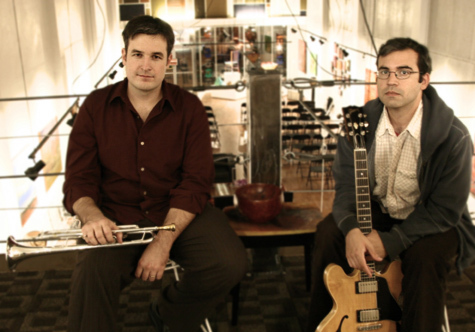 Bridges - TIN|BAG (Mabnotes Music) - This duo takes its name from trumpeter Kris Tiner and guitarist Mike Baggetta, the former based on the West Coast, the latter on the East. When they get together, they make music that is intimate, often spare, quite musical yet also conversational. After all, the best creative music, large or small ensemble (even solo), is made up of conversations between people "talking" on their instruments. On "Bridges", their 3rd CD, one is quite aware of the other member of the group - silence. These pieces grow from melodies but neither feels the need to fill every second with sound. The tunes go in unexpected directions. For instance, "Maslow" opens with solo trumpet playing a poignant, spare, melody; when the guitar enters, he plays "tolling" chords before moving out of tempo as Tiner plays above. They seem to moving apart from each other, at times, but always forward. Baggetta's solo is short, minimalistic, with chords that ring. The opening piece, "Bobo", has a melody that references "Autumn Leaves" and a rhythm, delivered by guitar, that alternates between clearly stated and "felt." The title track, one of two composed by Baggetta (6 are from Tiner's pen and the CD closes with Bob Dylan's "Just Like a Woman") has the feel of a Southern folk song, the guitarist moving slowly through the opening 2 minutes by himself, with clearly articulated lines. Tiner's muted trumpet as a stately feel, just a hint of blues with occasional smears and subtly bent notes. The piece shimmers, like sunlight reflecting off a lake barely brushed by a breeze. "Inayat Khan", named for the Sufi master, is solo trumpet, muted again, a melody moving slowly, clearly, softly, humbly, with obvious calm. As it fades, the duo moves into the Dylan tune; again, they do not rush through but stay close to the melody. "Bridges" contains beauty built of melody, interplay and friendship. One might say this is "escapist music" of the highest order, not raging against the inequities of the everyday but a celebration of the creative spirit that Kris Tiner and Mike Baggetta bring to their collaborations. We are the beneficiaries. For more information, go to www.kristiner.com and/or www.mikebaggetta.com. Glow - Pablo Held (Pirouet) - This is the 3rd CD release for the 24-year old German-born pianist-composer Held and his first for large ensemble. This is a fascinating 10-member group, with saxophonists Sebastian Gille and Niels Klein, trumpeter Menzel Mutzke, the harp of Kathrin Pechlof, bassists Dietmar Fuhr and Henning Sieverts (who doubles on cello) as well as Held's teacher Hubert Nuss (celesta, harmonium) and the leader's usual Trio mates, drummer Jonas Burgwinkel and bassist Robert Landfermann. With such a varied lineup, the music goes in many directions. The title track starts ever-so-softly, the tinkling keyboards, the low, long, tones of the reeds and brass, the volume growing steadily over 8:30 until the 2 minute fade back to silence. The opening track, slyly titled "Is This the End", rides in on a steady beat with voices rising out of the mix such as the soprano saxophone and drums. "LP" feels like a "big-band jam" with a rousing solo over the active rhythm section; the basses gleefully move around each other while Burgwinkel goes into attack mode. Held takes a fine solo, hopping atop the drums for a hard-edged romp. Throughout the program, the arranger Held mixes and matches. On "Secret", it's the bowed bass and pizzicato/bowed cello leading the way for a good portion, continuing their dialogue beneath the lengthy piano solo. "This is What I'm Asking For" is a brooding yet powerful work that may remind listeners of the big band sounds of Muhal Richard Abrams. It reaches its first climax halfway through and, just as you think it's fading away, the basses and drums move into a propulsive rhythm for a tenor solo that brings the piece to an equally rousing climax. The program closes with a composition by Peter Held, the leader's father. It serves as a fitting close, softer, quite melodic with sections for solo harp and a long fade with piano and celeste quietly sharing the melody. At times, "Glow" is reminiscent of Miles Davis' "Filles de Kilimanjaro" and "In A Silent Way" - it shares those recordings' sense of exploration and freedom. Held is not afraid to take chances and succeeds more often than not. The swirl of the basses, the reeds rising and falling, the exciting drums, the impressive piano work, stays in one's memory long after the music fades. Sprawling and adventurous, the music of young Mr. Held shows much promise. To find out more, go to www.pirouet.com/home/news.php and follow the links.